• Reporting & Water Safety Adviser contact details. Visiting crews will be offered a safety briefing to ensure the navigation rules for Henley Reach are followed. 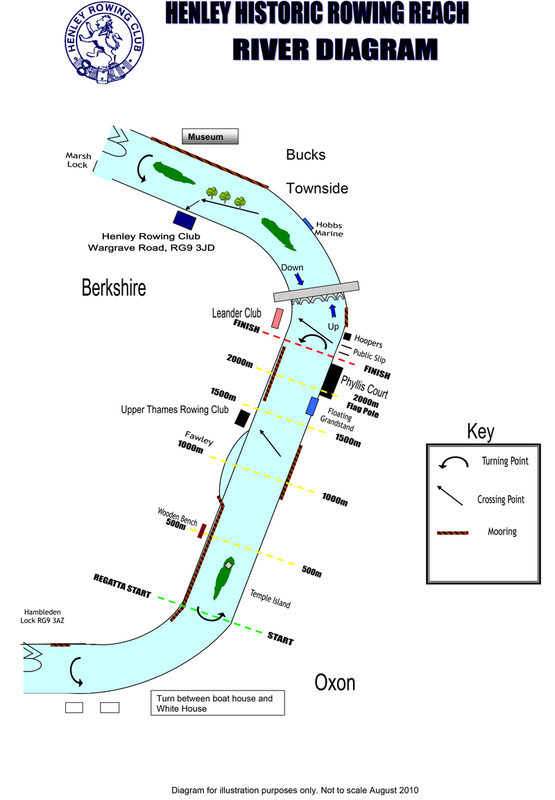 The rule is keep to the right; that is crews (and scullers) proceeding downstream from Henley Bridge to Hambleden Lock keep to the Berks (Clubs) side, and those coming upstream from Hambleden Lock toward the Bridge keep to the Bucks (Town) side. Temple Island is always passed to the right (ie. the island on stroke side). Crews being overtaken have a duty to stay clear but must take care not to stray into the centre of the river particularly when coming upstream. Crews should always boat facing upstream and have a duty to avoid those coming downstream. Particular care must be taken when crossing to and from the Bucks (Town) side to gain access to or leaving club landing stages, and crews coming downstream have right of way at all times. Under no circumstances may crews turn around or below the ‘Danger’ board at Hambleden Lock. Crews turning, particularly at Temple Island and the New Street slipway, must take care to avoid other boats already on passage, especially those on set work pieces. Counting from the Berkshire bank crews coming downstream should use arch two and going upstream arch four. The centre arch should always be left clear for cruiser traffic. Crews leaving the Leander raft must always ensure that the river is clear for them to do so and likewise when crossing from the Bucks side to the raft. The purpose of RowSafe is to help people participate in rowing without putting themselves and others at unacceptable risk. It makes clear that everyone is expected to take care of their own safety and the safety of others. Make sure you read the updated guidance to help you to take part in rowing to the best of your abilities. Updates to RowSafe for the 2018 release address the opportunities for improvement identified by users and the wider community, incorporates the Safety Alerts issued over the past year and extends the scope of RowSafe to include Ocean Rowing.